From a third generation copy of a photo of Andrew Flanagan. Original owned by Leonard Fliedner. The bare outline of Andrew Flanagan's early life is hinted at in the bits of personal identification he provided when opening his Emigrant Savings Bank Accounts and also in a biographical sketch of his son Andrew Jr. as published by Chapman Publishing Company in 1896. Since I have transcribed these elsewhere, I won't repeat them here. Suffice to say that these enormously helpful sources should be treated with caution. I've annotated their known errors to the best of my knowledge. Also helpful was Leonard Fliedner's brief sketch of Andrew and Sarah, drawn largely from remembrances of old timers, and subject to the usual hazards of memory. 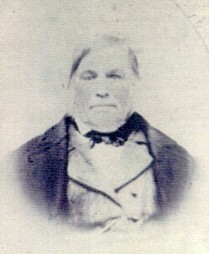 Family lore says that Andrew Flanagan was born c. 1804 in the Irish county of Roscommon. Andrew's own statements, made in in 1852 and 1856, contradict the legendary place of origin--to an extent. He stated that he came from the parish of Athleague in County Galway, with no mention of Roscommon. The parish of Athleague is an anomaly, however, in that it crosses the border between the counties of Galway and Roscommon. The Athleague parish seat is the town (village?) of Athleague, which is in County Roscommon. In other words, although Andrew evidently lived in Galway, family baptisms and marriages would have been performed and recorded across the county border in Roscommon. See Andrew Flanagan's place of origin for details. We have not yet attempted to access the registers of the parish of Athleague. His parents were Patrick Flanagan and Cecily Galvin, both deceased. While we have no evidence that Andrew's siblings moved to New York State, there was indeed a Thomas and a John FLANAGAN in the 1850 federal census for Newtown, Queens, NY, in other words, Astoria. Both men were born in Ireland, married to women born in Ireland and close to Andrew in age. Both had three children who were born in NY. Neither of these families was listed in the 1860 census the 1864 Astoria directory, the Queens County registry of deeds or index to probate, so it is likely that they left the area. A Michael and a Thomas were listed in the 1888 directory, but I have not followed them any further. The parental names of Patrick and Cecily are problematic. We have no reason to doubt the names, but one wonders why Andrew didn't follow the tradition of naming his children after his parents. Instead Andrew used his siblings names -- James, John and Bridget; Ann Nora, after Honora. Was there a rift between Andrew and his parents? Did he lose his parents at an early age? Was he raised by older siblings? Did Andrew simply not consider himself bound by that tradition? Or were the names given erroneously. "upon attaining mature years he went to England, where he learned his trade - that of a mason - and remained there until coming to America in 1832 or 1833"
One family story has it that Andrew moved to England as a child, but I suspect that the Chapman sketch got it right. If Andrew had moved to Birmingham/ W. Bromwich as a child, the move would have been made with parents and siblings. It would follow that someone in a family of that size would have put down roots in the area. But there are few references within the records of West Bromwich to the surname Flanagan. Further, Andrew states that in 1850s all his siblings resided either in the U.S. or in Ireland. There was no mention of England. None of this evidence is overwhelming, but I think it more likely that Andrew made the trek to West Bromwich as a young man, perhaps at 18 (circa 1822), the traditional age for migration. And if siblings accompanied him, they also failed to put down roots in England. Chapman's statement that Andrew learned the craft of masonry in England also seems reasonable. I've written what we know of Andrew and Sarah's marriage in West Bromwich and the birth of Ann Nora in Sarah's sketch. Here, I should address one issue, that is a statement in Leonard Fliedner's ca. 1980s sketch of Andrew, that Andrew was an instigator in the founding of Mt. Carmel Church in Astoria. 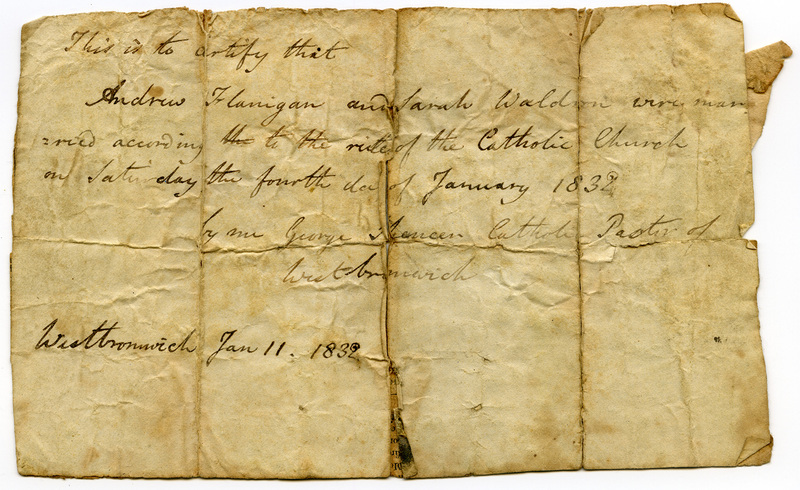 Circumstantial evidence shows that Andrew did indeed have have some connection with the founding group for that parish. St Michael (& the Holy Angels from 1877), Roman Catholic Church, in High Street, was built in 1832, in the Early English style, with a lofty turret at each angle. It was reconstructed in 1876-7 in brick with stone dressing, in the Early English style, and consists of a chancel, nave, and aisles. In 1911 a tower and spire was added. The Catholic Apostolic Church, in Victoria Street, was built in 1870, in red brick, in the Early English style, consisting of a nave, chancel, baptistry and a bell turret. The original registers of West Bromwich, St Michael (& the Holy Angels), Roman Catholic church for the period 1832-1878 (Bapts), 1833, 1841, 1843, & 1847 (Confirmations), 1833-1848 & 1853-1855 (Mar) & 1833-1838, 1858, & 1863-1889 (Deaths) are deposited at Birmingham Diocesan Archives. From information in Andrew's Emigrant Savings Bank accounts, we know when and how the Flanagans immigrated. The names of Andrew and Sarah Flanagan, both age 27, are listed on the second page of the manifest of the "Ship Alfred" from Liverpool entering the port of N.Y. Jul 12, 1834. (NARA series M237 reel# 23-list# 551, NARA-Northeast Region, Varick St, NYC.) They are listed under steerage, near the bottom of 2nd page. The first page of of this ship's manifest is readable. Subsequent pages are so dark that identification of Andrew and Sarah's names on page two would have been nearly impossible without prior knowledge of the date and ship. Sarah do age 27 female, [no occ. named], Irish [sic], USA. Andrew's siblings might have immigrated before him. Andrew, a staunch Catholic, would have been discouraged by the Protestant establishment of England. Unknown personal factors, such as family deaths. Possibly of their daughter Ann Nora.